Have You Seen Our Video Clips at Myspace? Sanctuary videos change throughout the month, so keep checking back to see the latest! Log in, click on "Find Friends" and then type: Majestic Waterfowl Sanctuary into the "Search for People" field. Jocamo tells Puff Daddy all about it! Moon-Moon plays with his tub toy! Duck-sitting Winston & Mr. Pearl! If you can�t adopt, please consider sponsoring a duck or goose in our care by visiting our sponsorship page. Complete with inspiring anecdotes and over 150 full color photos, if you have a pet goose in your life or are considering letting one join your family, this guide is an absolute must. A portion of all proceeds are being donated to Majestic! * For our full recommended reading list, click here. If you order from Amazon by way of our website, Majestic receives a portion of the proceeds! The Majestic Monthly is published 12 times per year. Previous issues are available in our Archives. A portion of all proceeds go directly to our sanctuary! This month's Mug-of-the-Month features Duran-Rio! Rio is one of our rescued Duranasaurs who loves treats and plenty of interaction. Click Here to order your mug today! Please do NOT send payments directly to Majestic. This is the reference book that goose-lovers have been waiting for! 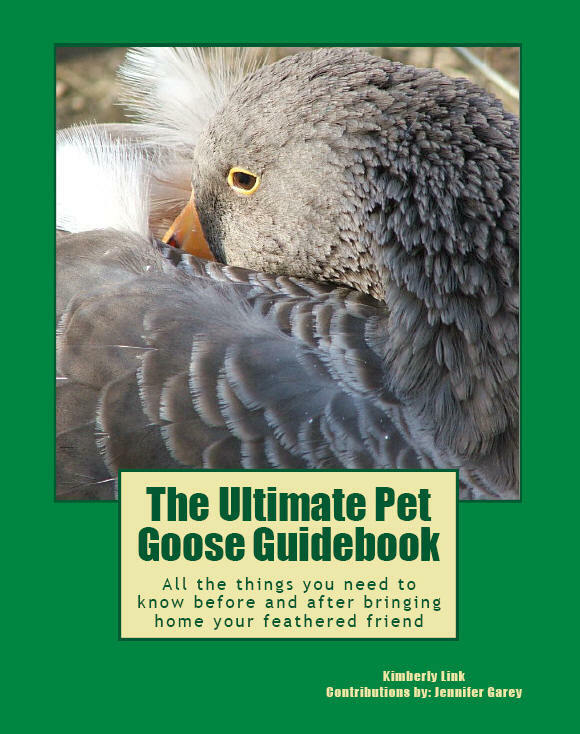 Everything you’ve ever wanted to know about your geese all in one comprehensive, pet-friendly guidebook. Written by the Founder & President of Majestic Waterfowl Sanctuary, a rescuer who understands the connection between pet geese and their guardians, and with contributions by Jennifer Garey, this guide treats your feathered friend as a loving and worthy companion. Based on first-hand experiences and containing the answers to hundreds of questions, this guide covers everything from day-to-day care to serious medical issues. You’ll learn essential tips on food, housing, flock management, enrichment and more! A portion of all proceeds are being donated to Majestic to benefit our rescued ducks and geese! Harnesses, Booties & Pillows, Oh My! When we stumbled upon the website for indoorducks.com we just knew we would have to feature their products in our next newsletter issue! Check out their fun and useful items! 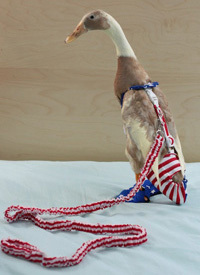 Diaper harnesses and leashes come in a variety of colors and can be sized to fit your pet duck or goose! 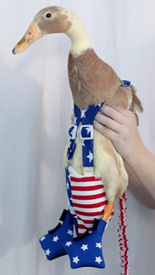 Waterfowl shoes come in a myriad of color combinations and can be specially ordered to fit for your pet duck or goose. Not only fashionable, these vet-approved booties can be fantastic for post-operative foot care. With a special no-slip bottom, these little shoes Velcro closed to keep feet clean and dry! Waterproof pillows are easy to keep clean and make cozy nesting spots for your pet duck or goose. And for added fun, you can color coordinate! To purchase these and other wonderful waterfowl products, visit indoorducks.com! Indoorducks is currently running a fundraiser sale on their products in order to help cover vet costs for their pet duck Norie's medical care. You can take advantage of this great sale and get some fun goodies for your duck or goose at the same time! Benefit Certificates are like gift certificates. If you purchase one and then wait until October 1, 2010 to redeem it, it will be worth 120% of the purchase price! They are also featuring their "help our duck, save a buck" sale. For every $1.00 spent, you will get a 1% coupon towards one item on your next order. If you spend $43.00 on your first order, you will get a coupon for 43% off of one item off of a future order. What a great deal! Do you love the color purple? So does Norie! Everything purple is 15% off! 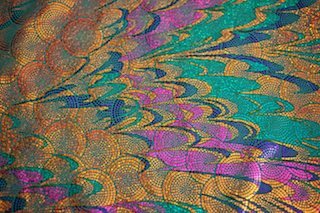 This includes special limited-edition fabrics, so go take a look before it's too late! Please visit their website for further details, rules and restrictions. Special thanks to the folks at Indoorducks.com for donating a pair of booties to our sanctuary for future use on our rescues! This summer has brought us some extreme heat and we know our southern friends have had it even worse than us. Remember to protect your flock from heat stroke in this hot weather by providing plenty of shade. Be sure to change out water buckets and kiddy pools frequently with cold water to help them cool off. Many of our flock members enjoy being sprayed with cold water from the hose, while others prefer to relax beneath our misting system. If your pond water is warm, you will need to put out kiddy pools filled with cold water and change them out as needed to prevent the water from warming. In some regions it may become necessary to bring your flock members into an air-conditioned barn during the hottest hours of the day. They may protest, but it's for their own good. If you see your duck or goose panting excessively, continually lifting their wings up and down (in an "airing their armpits" motion), standing motionless directly under misters for long periods of time, attempting to submerge themselves in their water buckets, or acting uncharacteristically, these can all be early warning signs of heat stroke. If your duck or goose experiences any of these symptoms, immediately remove them from the sun and heat and into a cool area. Dip their webbed feet into a cool (NOT cold) bath to SLOWLY reduce their core temperature. If this is not enough, small ice packs can be placed under their wings for up to 60 seconds and then removed for a few minutes. Continue to place on-and-off-again as needed. If the situation persists, bring your pet to the vet for immediate assistance. Majestic Waterfowl Sanctuary makes no representation, warranty, or guarantee in connection with any guidance provided on this website. Majestic Waterfowl Sanctuary expressly disclaims any liability or responsibility for loss or damage resulting from its use or for the violation of any federal, state or municipal law or regulation with which such guidance may conflict. Any guidance is general in nature. In addition, the assistance of a qualified professional should be enlisted to address any specific circumstances.